He continues to do well at Keeneland and turned in his typical Doug O’Neill workout. He still, however, keeps cocking his head slightly to the right as if looking at whatever activity there is along the rail. The key has been to build up the colt’s foundation, having had only one two-turn race, and he should be dead-fit on May 7. This is such a wide-open year, with at least a dozen horses having a legitimate chance to win. Or is it? Perhaps it really isn’t that wide open, and there is one very special horse who will be making most people smack their forehead after the race. He is definitely the horse to beat, and the pace scenario of the race seems to fit his running style, as he should be laying just off Danzing Candy and Outwork, unless they’re going guns blazing. He showed in the Breeders’ Cup Juvenile, he can come from farther back if need be. People don’t realize just how versatile this horse is. Desormeaux said the colt was as confident going into the Santa Anita Derby as any horse he’s ever seen, and added that he was not that way in San Felipe. If that is the case, that’s definitely something you want to hear. Although Exaggerator made spectacular moves in both races, he seemed much more in control in the Santa Anita Derby and did it more on his own. I can’t remember any horse who has changed his persona more than this colt has changed from his 2-year-old campaign to his last two races. He has turned from a solid runner with no definitive running style into an explosive weapon. It could very well be that of all the preps this year, the key one will turn out to be the San Vicente Stakes. Perhaps that will cause Churchill Downs to have second thoughts about not awarding any points to some of the more prestigious sprint stakes. Perhaps we can actually look to the past and the way things used to be done to set things right in the present. When it becomes crunch time you can depend on Baffert to start using his favorite weapon – speed. Baffert doesn’t fool around in his serious Derby training, so it shouldn’t have come as a surprise when Mor Spirit rattled off fractions of :11 2/5, :22 2/5, :34 1/5, and :46 en route to his :59 4/5 five-furlong work. This is vintage Baffert, although I would like to have seen a final eighth faster than :13 4/5, which is not what you want to see from a Derby horse. Obviously those early fractions were faster than he wants to go and he slowed down noticeably. The pace scenario should set up well for Mor Spirit, as he is one of the few horses in the race who can lay relatively close and still come home, but as mentioned before, he cannot wait until deep stretch to engage that final gear. He has to show whatever turn of foot he does possess earlier or at least steadily make his way into contention by the time they straighten for home. He can be placed anywhere from two to six lengths off the lead, depending on the pace, and if he should get sucked farther back in the field, he can adapt. But with his size and stride he can’t afford to get stopped, even a little. It is difficult separating him from the other deep closers, but I decided to go back to my first Dozen and depend on my initial gut instincts and give preference to the horses I had ranked high originally. He was ranked No. 2 and I still believe Romans or Kiaran McLaughlin are sitting on a Derby win, compliments of the Derby gods, and he’s won at Churchill. Romans wasn’t able to get Cherry Wine or Unbridled Outlaw to the starting gate (although there is still a very remote shot with the former), so it all falls on his original big horse, Brody’s Cause, who will have to improve dramatically on his Beyer figures, if you put any stock in that. Remember, with only two starts this year, he is going to have to depend pretty much on just the Blue Grass Stakes to set him up or the Derby, as he barely picked his feet up in the Tampa Bay Derby. He received quite a bit of buzz last week when Victor Espinoza, winner of five of the last Triple Crown races, signed on to ride him throughout the Triple Crown. And perhaps Espinoza, despite his success the past two years, will go into the race with a chip on his shoulder, having been snubbed by the Hall of Fame voters. Many have questioned Whitmore’s high ranking because of his three defeats this year and always finding a way to lose, but he has the quickest and most consistent turn of foot and hasn’t had a decent trip yet. If you are a trip handicapper and follow the speed sheets, you have to give this gelding a chance, based on his ground loss and troubled trips. We really have no idea what he’s capable of if he should finally get a clean, ground-saving trip and one of Espinoza’s better rides. Watching the Arkansas Derby, it did look as if Quinonez asked him earlier and got little response, eventually passed by Whitmore and Creator on the far turn. Once in the stretch, he finally kicked in with that explosive move, so perhaps the horse wasn’t getting hold of the track, as Quinonez claimed, until he turned for home. Even with the abundance of powerful closers, I still believe he can outclose any of them. But he needs to be put in a position to win, and not just fly home late to pick up a piece of it. We saw his devastating closing power when he blew by Whitmore in the Southwest Stakes and quickly opened up to win by over two lengths. There is no way of knowing if he’s going to get the right kind of trip or if he can get in a position to win, but knowing he’s going to be flying home is good enough to have him ranked this high, especially having seen last year just how versatile he really is and how much speed he really has. If he can put everything together on the one day it counts he should be right there at the finish. In a year like this, it doesn’t take much for a horse to make a dramatic move, and considering he was No. 1 for so long, his sensational work was enough to suggest that getting to Kentucky early and flourishing over this track was just the tonic to help one forget the Florida Derby fiasco. It was important to see several things in his first work since the Florida Derby – one, how he handles the track; two, how he bounced out of the Florida Derby physically and mentally and whether his energy level was high; three, how much of the work did he do on his own; and four, how he came out of the work; was he blowing hard or did it take little out of him. Mohaymen delivered big-time on all four points. When I watched him galloping out after the work, I thought at first that he was beginning his work. So because of all these factors I am giving him the benefit of the doubt and putting him back in the Top 12. I would imagine his next work will be more of a maintenance drill. If there was one thing I would have preferred, it was to see a work like this a little closer to the Florida Derby and that he would go into the Derby off three works instead of only two. But, so far so good. Irad Ortiz Jr. went off Whitmore to ride for Brown, who put him on My Man Sam over once undefeated Gotham winner Shagaf, who he’s ridden in all his starts. We know he can power home with the best of them, but with so many talented deep closers just like him, he’s going to need a perfect ride and clean trip, which applies to all the other deep closers. He doesn’t have the foundation that Suddenbreakingnews, Brody’s Cause, and Creator have, so everything is going to have to go perfectly for him, and he has to be as classy and talented as his connections believe he is. Remember, only two horses I the past 98 years have won the Derby with four or fewer starts, so he does have his work cut out for him. But I have been extremely impressed with what I’ve seen so far and believe that he just may be that good, especially remembering how long a sustained run he put in in his second-place finish to Matt King Coal in an Aqueduct allowance race. To run the race he did in the Blue Grass in his stakes debut and making only his fourth career start was very impressive. He has had nine races in 7 1/2 months, all of them two turns, so he has quite a bit of mileage under him. Now he comes back in three weeks and makes his fifth start this year in 2 1/2 months. This could be where all that Peruvian stamina will come in handy. He looks like a tough old school type of horse. He worked well enough at Churchill Downs, and appears ready for more action. You have to respect this horse if anything else, and you can’t count him out. His ranking probably is too low for an impressive Arkansas Derby winner, and he also gets that Steve Asmussen – Hall of Fame angle that has been mentioned on several occasions. Like the other deep closers he’s going to have to get lucky, but he did enough broken field running in the Arkansas Derby to suggest that he can make his own luck. Normally, a horse with his credentials would be ranked much higher, but there is such a log jam you’re just splitting hairs once you get past the top 2. His speed figures have been slow and he is coming off a six-week layoff with only two starts this year. And the Louisiana Derby has not been a good Derby prep, in that it has never produced a horse to make a direct leap to the Kentucky Derby and come away victorious. Only two Louisiana Derby winners have captured the roses and they both had a race in between. But I have to admit I was very impressed with his last workout at Churchill Downs, in which he came home his final eighth in :11 3/5, galloped out a strong 6 furlongs in 1:13 1/5 and pulled up a mile in 1:39. More important than the time was how much smoother and more professional he was down the stretch than he’s been in his races. So perhaps he has cleared a major hurdle in his career. He has the right running style and will be laying just off the pace, and if he gets as much of a dream trip as he got in the Louisiana Derby he should be right in the thick of things at the finish. But you can never count on a dream trip in the Derby. He definitely would be ranked higher if he had one more start, especially with two of his starts coming in short sprints. From a pure talent standpoint he can stack up with most of them, and how dangerous he will be in the Derby could depend a great deal on whether Danzing Candy runs and if he gets speed crazy again. Just in case he does, Pletcher worked Outwork behind two horses and the colt turned in a super move, putting his two workmates away with ease and was striding out beautifully at the wire before galloping out strong. So it would seem that the pace scenario looks quite clear with Danzing Candy on the lead and Outwork tracking him, with their fate depending on how fast they go. It should be noted that Danzing Candy’s broodmare sire Songandaprayer set the fastest half-mile fraction in Derby history (:44 4/5), so it’s not going to be easy for this colt slow the pace down very much. He is another who would be ranked higher if he had one more start, meaning a race between the Tampa Bay Derby and Kentucky Derby. History is made to be broken, but he’ll have to do if first. It shows how much the Derby has changed when speed figures can alter a horse’s entire preparation. I had jumped this colt up from No. 12 to No. 2; that’s how impressed I was with his Sam Davis and Tampa Bay Derby and how much progress he’d made, developing into a classy and professional racehorse. Everything was moving along smoothly as he paved an impressive path to the Derby until his Ragozin number came out for the Tampa Derby and completely changed their course of action, pretty much forcing them to train up to the Derby off an eight-week layoff and never having been 1 1/8 miles, something unprecedented in Derby preparation. I will not be audacious enough to say it cannot be done, not in this day and age. But I have to remain skeptical until a horse actually does it. Perhaps with his natural ability and strong pedigree he can become a pioneer and you’ll have horses doing the same thing. It eventually will reach a point where the Derby horses will become complete strangers to us. A little early offbeat wagering angle for your pleasure. OK, I have figured out how to approach this year’s Kentucky Derby. Remember when George Costanza came to the realization that every decision he’d ever made in his life and every instinct he’d ever had was wrong, so he decided to do the opposite of everything he normally would do? When the waitress in Monk’s coffee shop came over and confirmed George’s regular order, “Tuna on white toast, cole slaw, and a cup of coffee,” he shot back, “No, wait, I always have tuna on toast. Nothing has ever worked out for me with tuna on toast. I want the complete opposite – chicken salad on rye, untoasted, a side of potato salad, and a cup of tea.” From that point on, he did everything the opposite and his life changed dramatically for the better. Well, I am so bewildered by this year’s Kentucky Derby and have discounted so many horses who are going against history and tradition, in which I believe strongly, I have decided to pull a George Constanza and go against all my instincts and do everything the opposite. I will now look at the Derby as a chicken salad sandwich on rye bread…and I’m a vegetarian. Mohaymen and Shagaf, two previously unbeaten horses, running poorly in their final prep? Doesn’t bother me at all. They’re in. Destin, coming off an eight-week layoff and never having been farther than 1 1/16 miles, something that hasn’t been done in modern times? Who cares? I’ll take him. Gun Runner, trying to win the Kentucky Derby straight from the Louisiana Derby, which has never been done, and off a six-week layoff? No sweat. Throw him in there. My Man Sam, Outwork, and Shagaf (again), trying to win the Derby off four or fewer career starts, something that has been done only twice in the past 98 years? Doesn’t faze me in the slightest. So, there you go, my George Costanza exotics box – MOHAYMEN, SHAGAF, DESTIN, GUN RUNNER, MY MAN SAM, and OUTWORK. History, logic, and tradition be damned. With that said, if anyone follows this cockamamie box and it blows up in your face, blame George Costanza, not me. But wait a second. At one point or another this year I’ve liked all these horses before they went astray. They have all been in my Top 12, and I even had Mohaymen and Destin ranked No. 1 and 2, and Gun Runner No. 4. Maybe I should go against history and tradition to an even larger extent than that and put everything on the nose of Lani. A Japanese owned and trained winner of the UAE Derby? Now that’s doing the opposite of what I, or anyone, normally would do. And how much more opposite can you get than betting on a horse who works the same day Mohaymen and Mo Tom go a half in :46 4/5 and :47, respectively, and goes his half in :52 4/5 and five furlongs in 1:06? But you know what, the Japan Racing Association was nice enough to send me video links to every one of his races, and there actually was a lot to be impressed with. And the Japanese train so differently than we do. And in my opinion, he’s the best bred horse in the race. I’m even ignoring the Nyquist with only one two-turn race and one sprint obstacle, but I remember the big race Danza ran in the Derby a few years ago off the same 7-furlong sprint and 1 1/8-mile stakes victory. So I’m not including him in my all-opposite box, especially with him being the favorite. But you are welcome to if you have the money to spend. So, what all this boils down to is talent vs. tradition. All these horses should run big on their talent. But tradition and history says no, and I consider myself a traditionalist and a historian. But I also believe in talent, so I’m right back where I started – bewildered, confused, perplexed, puzzled, mystified, and back to tuna on white toast. Getting back on course, I wanted to keep MAJESTO in the Top 12, but couldn’t resist putting Mohaymen back. He still, however, is my longshot sleeper for all the reasons mentioned last week. I just watched his last gallop and loved what I saw. Extremely focused, ears up and head perfectly straight, and most of he was really down into the bit. He did everything the right way and you couldn't have asked for a better gallop. I was very impressed with SHAGAF’S last work, especially after an opening eighth in :12 4/5 the way he rattled off fractions of :11 4/5, :12, and :11 4/5 before going out another eighth in :12 4/5 and pulling up 6 furlongs in 1:14 3/5 with another strong eighth in :13 2/5. I know he’s never run fast and is coming off a fifth-place finish, but I still have this nagging feeling that he’s going to surprise a lot of people. I see him in a perfect spot sitting behind the leaders, and I think he has the closing power to really make his presence felt as a huge huge overlay. LANI had a nice little 3-furlong blowout Wednesday, although it was scheduled for 5 furlongs. The horse, however, had other ideas. He did come home his final quarter in :23 2/5, but was on the wrong lead and had to be hit once right-handed with the whip. But remember, he's run on left- and right-handed tracks so I can excuse him being on the left lead. We'll see how handles his lead changes over the next week. There is still something about him I find intriguing. But in this field, it’s easy to find a lot of intriguing horses. 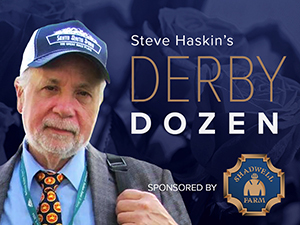 Remember, next week there will be the final Derby Dozen and a selections/wagering column later in the week. Unfortunately, all my observations regarding training and overall appearance will have to be done using whatever is available on TV and the different websites and Twitter. For the first time in over 25 years I won’t be there to observe all the Derby horses close up.